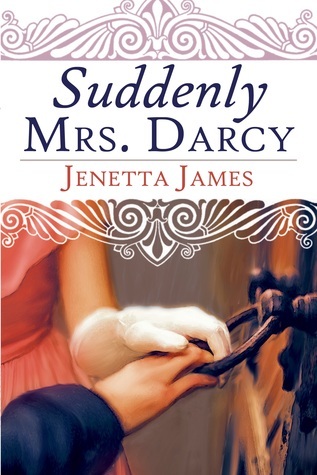 Two years later, I am finally reviewing Suddenly Mrs. Darcy! I read it when it came out but for some reason I didn’t review it, considering it is my favourite “forced marriage” scenario book, it didn’t seem right not to post a review, so here it is. When I started reading this book I was shocked and amazed. The blunt, fatalist first person speech we see in the first chapters as shocking as it is surprising but it pulls us immediately into the book. The writing is riveting and addictive and I have now come to understand that Mrs. James writing style is unique and recognisable everywhere. When I read the first letter of Elizabeth in The Elizabeth Papers over an year later, I immediately knew it was a Jenetta James book due to the uniqueness of the writing style. On this book, Elizabeth and Mr. Darcy are caught alone by Mrs. Bennet during the Netherfield ball while Darcy is trying to reveal to Elizabeth Wickham’s true character, and because of that they are forced to get married. As this happens so soon in the storyline, they haven’t been able to sketch each other’s characters yet, so the dynamics between them are very different, and the path they have to take to HEA will be much harder. They will need to learn how to respect, trust and love each other and, it will not be an easy task when the communication between them is still so difficult because of their misapprehensions and prejudices. But watching them build a strong and powerful relationship is extraordinary, and Mrs. James was able to keep us glued to the storyline from the beginning until the end due to the intensity of the book. Suddenly Mrs. Darcy is very real, it is not overly romantic, it is not a fairy tale, it portrays reality and people as they are, it shows us a raw reality and it pierces into our soul. It is one of those books I recommend to my friends who don’t read JAFF because I know that the writing is so good, so unmistakingly good, that any reader will love it! I believe that it takes a true talent to write as Mrs. James does, this is something that you can not learn, either you have the talent in you, or you don’t, and Jennet James certainly does. If you are looking for a fairytale story full of fluff this is not the book for you, but you will be missing a magnificent work of art. If you are ready to accept some angst, you will love this book and it will render you speechless. I loved reading your review which reminded me of all the reasons I adored this book. Great review, Rita! And, LOL, I’ve forgotten to review books and discover it much later, too. Rita, I loved this review. I look forward to reading it. I’ve wanted it since it came out. I was drawn to it by that cover… simply beautiful. Thank you for explaining about the writing style. I will be sure to look for that as I am reading it. Thank you for leaving a comment and I hope that one day you read and enjoy it:-) The cover is lovely isn’t it? It is all the work of Meryton Press’ Zorylee Diaz Lupitou who has such talent in that department. The cover is very lovely and intriguing. This book I believe was the 3rd Variation I read, it was hot out of press. As soon as I saw the cover I was drawn to it . I can almost sense the hesitation in the lady’s hand on the knocker. Very talented work of art in deed! Oh, you should move this one up your TBR pile Jeanne, it is one I certainly recommend!!! It is one of the best I’ve ever read!!! Rita, this is one of my most favorite P&P variations. I believe I have read it three times. The author has truly captured Mr. Darcy’s shy and hidden love as well as his reticence and over inflated pride. I also loved seeing The respectful relationship that Elizabeth established with her husband who she was forced to marry. As you said it eloquently, both Darcy snd Elizabeth are real with it is nice to see that underneath all her bravado, Elizabeth is a young woman in the need of knowing that she is loved and cherished. Your review is spot on and I have nothing more to add besides cheering for Our dear author. I read this when it first came out and loved it. I am hoping to see more stories by this author but she does lead a busy life. I can add my recommendation to yours. I love this review! This book means so much to me. This was the first project ever with Jenetta James! Since then she has become so dear to me. I loved this story from the first scene. And agree…her “The Elizabeth Papers”…Brilliant. And I have the inside scoop that she is publishing a new Regency P&P early in 2018. I’m looking forward to her next book Christina. I can tell she is truly talented and I’m sure the next book will be brilliant!!! Lovely review and so accurate! I too loved this book! Loved reading your thoughts on this one,especially the way in which you expressed how realistic and honest it is. No fluffy sugar coated portrayal of Darcy and Lizzy here,but a true reflection of them trying to come to terms with this new reality. thank you for the comment Mary – I was very touched by this review. Hi Mary, yes, that’s precisely what I love about it. No fluffy sugar, just pure raw feelings 🙂 Perfect!!! Fabulous review, Rita! Oh, I loved this book!!! It was the first one I read by Jenetta James and I was hooked, she writes so beautifully, and yessss, that’s exactly it, her writing is so realistic and speaks right to the heart! What a great review. You describe it in such a thoughtful way. Thank you Emma 🙂 I hope you like this book when you read it! I was lucky enough to win a paperback copy of this book and have to confess that it’s still languishing on my physical TBR pile. However, it IS at the top of that pile already and if it hadn’t been, it would have been bumped up to there after reading your review, Rita. The Elizabeth Papers is another book on that pile! OMG, if you have it, you have to read it Anji! It is really good! I doubt you’ll regret reading, in fact, I’m quite certain you’ll regret waiting so long to read it. I don’t say this about many books, but this one is really extraordinary! I’m in the middle of it right now Rita. It’s a real page turner, isn’t it?